Boy Kings Treasure is based on the Egyptian King Tut. Players will be transformed into this magical world with characters that we associate with Egypt such as worshipped cats and snakes. 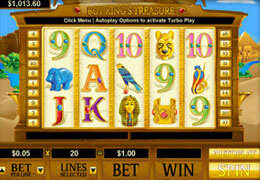 The high quality graphics and superb sound effects add to the slots authenticity. Imagine a sizzling hot desert with pyramid silhouettes in the background and then you see a cool shade of an oasis welcoming you. 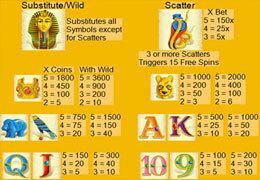 Bets range from as little as $0.01 up to $5 and players may choose to play anything from 1 to 20 pay lines. The Wild is the Boy King icon and substitutes all other icons except the Scatter. The Wild helps form winning combinations that will double all winnings except during the free spins round where it will serve as an accumulate multiplier to increase your reward by up to 16x. The Snake is the Scatter and will reward you with 15 Free Spins if you have 3 of them appear anywhere on the reels. All winnings will be tripled in this round plus the free spins can be re-triggered. Players may make use of the auto play button as well.